I really liked the vibe and energy I felt when I attended the Open Day at City, which was something I didn’t perceive at other universities. I felt a balance between the social and learning aspect and this was one of the key reasons that made me want to apply. For me personally, the website, Applicant Days and talking to students really helped. The website allowed me to look at the individual modules in my course to get a real insight into what I would have been studying. Luckily, I already knew many City students thus I was able to ask any questions I had. 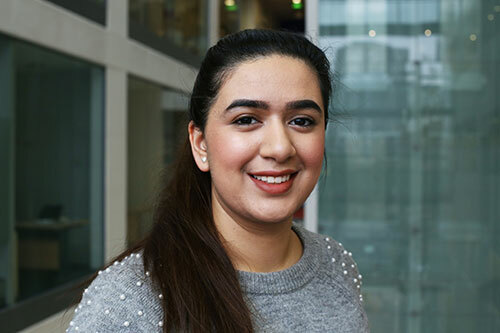 I am a student ambassador and also a Widening Participation tutor. These extra-curricular activities have allowed me to meet different students and gain a lot of experience. Additionally, it’s great getting that extra bit of money as being a student in London isn’t cheap! I plan to either do a master’s or get a graduate role job (hopefully). I’d say the best thing is to make the most of your university life as it won’t come again. Try your best to look into the course in terms of modules so you actually know what you’re going to study and whether you’re interested in it. I think many people look at the course name but not the nitty gritty parts, which, in my opinion, are key. This will ensure you’re actually studying something you like.